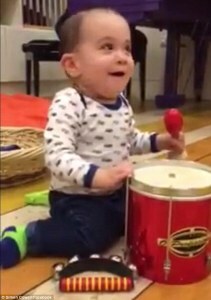 Simon Cowell's Son Is Already Playing the Drums! Simon Cowell’s son Eric is already a musical prodigy, playing drums along with One Direction. Looking to One Direction for his inspiration and to his father Simon for encouragement, the young 3-year old is beginning a joyous journey into musical fame. Really we’re not sure if the boy will grow up to be a musician or not. Perhaps he’ll stay in the managing business like his smart dad. But then again he may become a nuclear scientist. At any rate, he’ cute as ever now, banging out a beat to One Direction. He shocked the world when he became a dad at the ripe old age of 55 but Simon Cowell is clearly loving his new role. The proud father took to his Facebook page to share a sweet video of nine-month-old Eric enthusiastically drumming along to One Direction’s Story Of My Life. The video shows the tot – whose mother is Simon’s partner Lauren Silverman – banging along on a red drum while the boyband’s song plays in the background. Of course, One Direction, who found fame on Cowell’s X Factor, are Simon’s other babies and they have proved to be one of his best acquisitions. Over the past year, they have taken home a whopping £1 million a week – or £136,000 per day – in earnings as their popularity grows and their pay increases three-fold. The eye-popping figures, filed by their company 1D Media, see Harry Styles, Zayn Malik, Louis Tomlinson, Liam Payne and Niall Horan sit comfortably as Britain’s top-earning act. The group earned their cash through concerts, merchandise, sponsorships, record sales and royalties, as well as their 3D film, social media interaction and their third studio album. Much of their £49,093,233 fortune was earned close to home in the UK, while £3.58 million came from the US and £548,820 from the rest of the world. The total is up from £18.1 million in 2012, according to the paperwork filed with Companies House. The documents also show that as the company’s five directors, each of the band members picked up more than £5.6 million. But the company only paid £1 million in corporation tax, the official document shows. After administrative costs, the company was left with £3.75 million profit, up from £840,000 the previous year. The accounts cover 2013, when One Direction: This Is Us, a 3D documentary was released, topping UK and US box office charts and became the fourth highest-ever grossing concert film. The singers also toured Europe, North America, Asia and Australia, performing more than 100 shows, including six sell-out gigs at London’s O2 Arena. Simon Cowell’s son is playing drums already! Will Simon train him from youth to be a super-musician? Possibly, but I think Simon would rather let hte kid be whatever it is he wants to be. He’ll give his full support to his lovely boy and we’ll just have to wait to see what becomes of him.